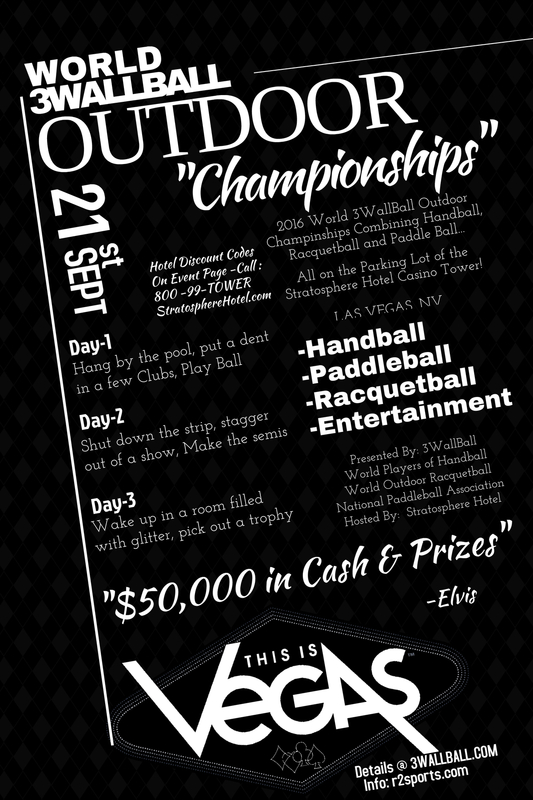 2016 3WallBall Outdoor World Championships (Sept 22-25) Deadline Now!!! The 2016 3WB Outdoor World Championships & 1 Wall International Challenge has finally hit it’s deadline to enter. WPH Outdoor will take online entries Saturday through the very early hours of Monday (Sept 17-19th) and may close down the entry at any time to begin work on the schedule, times, draws and event. The original deadline was Sept 16th to avoid a late fee. The Stratosphere Hotel Casino Tower has met their event deadline too; allowing special room discounts until Monday when you call their reservation line: 1-800-99-TOWER and use the code: C-3wb16 (The Internet Group Code has been discontinued you can only get the hotel discount by calling the 1-800#). This hotel discount will be good until Monday or until the Hotel sells out (whichever comes first). If you are bringing a family member, fan or friend to the championships or a junior player, then get them signed up in either the Non-Player Division or the Junior Division. The Non-Player will give the spectator all the benefits that the star athletes get, but w/out the court-time! Non Players receive a souvenir gift-bag, event shirt, food and drink coupons (at least one All-You-Can-Eat Stratosphere Hotel Buffet ticket), plus a ton of free swag. These are the biggest gift bags in our sport and the $40 fee to nab one is highway robbery and you’re the robber! These Non-Player entries can only be purchased on-line right now, before the deadline, as they will not be sold on-site! Just go to the event page and sign up like a regular participant, but select any “non-player” division. If you are bringing a Junior Player the the event, you can still register them now. Juniors will have Free Pro Clinics starting on Wednesday and one coordinated every day until the event concludes on Sunday. You youngster still in school? No worries, Juniors begin on Saturday, September 24th. Having troubles signing them in? Contact us right now and we will help. For questions or comments regarding the Non Player or Junior Entries, contact Dave Vincent (before the deadline) at vincent@wphlive.tv.